"Why are toilets for the disabled so bloody small?" "Sad. She refused to get off...SEVENTY YEARS ago." "Time to pull the plug." Is anyone else sick of these novelty coffins? Well it did say recycle your old bags here Love. It's time they revoked Granny's driver's licence. Marty!! Did you remember the flux capacitor? We only brought Nan along for the ride. D'you think we'd better get her out? She's been in there for a very, very long time. Everyone felt sorry for Grandma but what about the two year old she sat on. NHS solve the bed crisis. "Funny place to practice Gynaecology?" "Bloody heli, this isn't a good place for a knees up at all!" Why seniors should play video games. 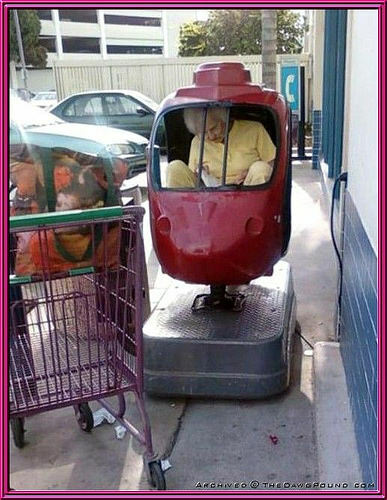 Nan enjoys a pleasure ride after a big shop. It's about this time of day that Nan pops on her costume and pretends she's a rhubarb and custard sweet. "Please help! Some hoodlums have vandalized my car!" Gran is no longer a member of the Rotory Club. It's a kiddy Ride not a Biddy Rides.